For the novel and movies, see The Manchurian Candidate. For the town in Inner Mongolia, see Manzhouli. Please help to improve this article by adding reliable references. Unverifiable material may be challenged and removed. The above, plus Sakhalin Oblast, which is generally included on Chinese maps as part of Outer Manchuria, even though it is not explicitly mentioned in the Treaty of Nerchinsk. 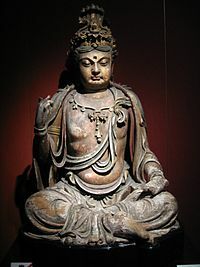 A wooden Bodhisattva statue, Jin Dynasty, Shanghai Museum. Manchuria was the traditional homeland of the Xianbei, the Khitan and the Jurchen, who built several dynasties in both Manchuria and China proper, and most recently and famously the Manchus, who lent their name to the region and, in the 17th century, conquered and ruled China until the collapse of the Qing Dynasty in 1911. Manchuria borders Mongolia in the west, Siberia in the north, China proper to the south and North Korea in the east. Prior to World War II, Manchuria was colonized by the Japanese, and Manchukuo was used as a base to invade China, an expensive action (in terms of the damage to men, matériel and political integrity) that was as costly to Japan as the invasion of Russia was to Nazi Germany, and for the same reasons. Manchuria was the traditional homeland of peoples such as the Xianbei, the Khitans, the Jurchen, and most recently and famously, the Manchus, who lent their name to the region. Manchuria is more technically referred to as Inner Manchuria or Chinese Manchuria, and is contrasted with Outer Manchuria or Russian Manchuria, a region that stretches from the Amur and Ussuri rivers to the Stanovoy Mountains and the Sea of Japan, encompassing Sakhalin. From 1945 to 1948, Manchuria (Inner Manchuria) was a base area for the People's Liberation Army in the Chinese Civil War and with the encouragement of Soviet Russia, Manchuria was used as a staging ground during the Chinese Civil War for the Chinese Communists, victorious in 1949.